Short sales are rising as banks start to shun foreclosures. NEW YORK (CNNMoney) -- Homes in some stage of foreclosure accounted for nearly one in four homes sales during the fourth quarter, according to RealtyTrac. During the three months that ended December 31, homes that were either bank-owned or going through the foreclosure process accounted for 24% of all home sales, up from 20% in the previous quarter and down only slightly from a year earlier when foreclosures accounted for 26% of sales, RealtyTrac said. In total, 204,080 distressed properties were purchased during the fourth quarter, down 2% from the year-ago quarter. For all of 2011, foreclosure-related sales were down 2% year-over year to 907,138, accounting for 23% of all home sales. "Sales of foreclosures in the fourth quarter continued to be slowed by questions surrounding proper foreclosure paperwork and procedures," said Brandon Moore, chief executive officer of RealtyTrac, referring to the delays cause by the robo-signing scandal that broke in late 2010. "Even so, foreclosures accounted for nearly one in every four sales during the quarter and for the entire year." 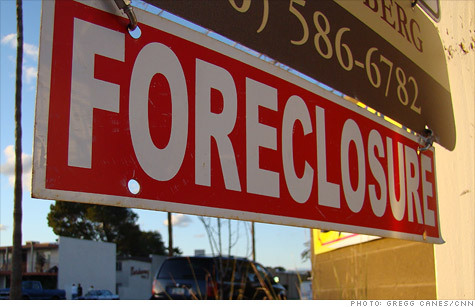 "We expect to see foreclosure-related sales increase in 2012, particularly pre-foreclosure sales, as lenders start to more aggressively dispose of distressed assets held up by the mortgage servicing gridlock over the past 18 months," said Brandon Moore, CEO of RealtyTrac. Short sales are starting to become the preferred method for banks to dispose of properties in default. In short sales, borrowers who owe more on their mortgages than their homes are worth agree with their bank to sell their homes at the lower market value. In return, the bank agrees to absorb the loss. During the last quarter of 2011, there were more than 88,000 short sales, up 15% compared with a year earlier, according to RealtyTrac. Short sales comprised 10% of all homes sold during the quarter. Meanwhile, sales of bank-owned homes fell 12% year-over-year to 116,000, comprising 13% of all sales during the quarter. "That trend will likely show up in more local markets in 2012 as lenders recognize short sales as a better option for many of their non-performing loans," said Moore. Short sales have become a more attractive option since all parties agree on the terms, leading to fewer legal issues, said Daren Blomquist, RealtyTrac's director of marketing. They also offer better returns. During the quarter, the average short sale sold for $184,221, while the average foreclosure sold for $149,686. And banks typically don't have to spend a mint maintaining a short sale home like they do a foreclosure, where they have to pay more in legal fees, property taxes, maintenance and insurance, said Blomquist. Short sale deals also get completed more quickly. During the fourth quarter, it took an average of 308 days, to complete a short sale. Foreclosures, meanwhile, can take years to complete. Quicker approvals mean fewer buyers get discouraged and withdraw their offers. Blomquist said some banks even pre-approve prices so deals close very fast. Short sales already outnumber REO sales in several "bellwether markets," including Los Angeles and Phoenix, where, in both cities, they exceeded 20% of all sales. Some lenders have even incentivized short sales in Florida and other hard-hit foreclosure states. They offer large cash rewards -- as much as $35,000 -- to delinquent borrowers in return for co-operating on these transactions. Distressed properties continue to make up a large portion of the sales inventory in many housing markets. In Nevada, they accounted for 56% of all sales during the quarter, the highest percentage of any state. California foreclosure-related sales claimed a 43% share, Georgia 39%, Arizona 38% and Michigan 33%.